The four 10” pneumatic tires greatly add to the comfort and stability of the scooter. It's good to go for up to an incredible 25 miles on a battery charge. It has a very large turning radius of 50”. It's bulky – will not fit into the trunk of your car or storage space of your SUV, really requiring an external (48”) lift or ramp. Though not really meant for maneuvering around small spaces this is a high-quality, robust 4-wheel scooter that will serve you well without breaking the bank. Here’s a high-quality 4-wheel scooter that you can drive all day on a single battery charge. The Shoprider Sunrunner 4 is a mid-size scooter that can accommodate riders up to 300 lbs. 1. Though it does not have shock absorbers and so can be bumpy when going over rough terrain the four 10” pneumatic tires (plus two anti-tip wheels on the rear) greatly add to the comfort and stability of this scooter. 2. The Shoprider Sunrunner 4 has a 3” ground clearance which helps when crossing long grass, loose gravel and uneven sidewalks. 3. The spacious (19” x 18”) captains seat is both comfortable and versatile with deluxe plush upholstery and full back support. The seat, with an adjustable headest, slides and swivels, controlled by easy-to-use levers. One lever allows the seat to slide forward and backward for extra legroom, if needed, while the other locks the swivel into one of four pre-determined positions, making it easier to get in and out of the seat from the side. The seat can also handle extra accessories such as an oxygen tank or walker holder. The armrests can also be adjusted for angle and width, which helps a lot with comfort. 4. The two 12v 35Ah (SLA – Sealed Lead Acid) batteries are charged via the on-board charger socket. Bright indicator lights let you know it’s charging and when they flash a solid green you know its fully charged. 5. It’s good to go for up to an incredible 25 miles. You really can take this mobility scooter out all day without worrying about losing power. 6. The highest speed it can reach is 5 mph. The electromagnetic brakes make sure that the scooter stops on a dime the instant your hand lets up on the joystick. 7. The front tiller can be adjusted through five angles and the seat height can be adjusted through five different height settings. 8. The scooter comes with a removable ignition key, rearview mirror, headlight and a large detachable front basket for storage. The Shoprider Sunrunner 4 comes with a lifetime (limited) warranty on the frame, the (limited) warranty on the electronics, motor, and brakes lasts for a year while the battery warranty lasts for six-months. But when it comes to maneuverability, the Shoprider Sunrunner 4 certainly isn’t a travel or folding scooter. It’s a bit bulkier than most other options on the market, measuring 48” long by 23” wide, has a very large turning radius of 50” making it almost impossible to move around tight spaces or maneuver through doorways in your home. And is also quite hefty, weighing in at around 180 lbs (with the batteries installed) and I’d say that it will not fit into the trunk of your car or storage space of your SUV, really requiring an external (48”) lift or ramp. The other negative with the Shoprider Sunrunner 4 is that the speed control is on the right of the front tiller, making it very uncomfortable to be used by anyone who is left-handed. This is a high-quality, robust 4-wheel scooter that will serve you well without breaking the bank. 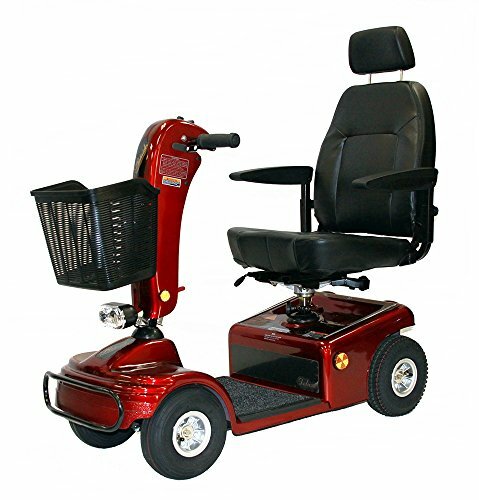 It’s not really meant for maneuvering around small spaces, but it does allow you to move freely around your local area without worrying about power or stability. So if you’re planning on using the scooter outdoors for extended periods of time and like the added safety then the Shoprider Sunrunner 4 comes highly recommended.